The great comedian and writer Wyatt Cenac, formerly a correspondent on The Daily Show, hosts the HBO show Problem Areas. The first season of the show focused on policing in America, because as he says, “the delicious rise of ramen restaurants was already taken.” The season featured several authors, organizers, and activists throughout the season that commented on different topics related to police brutality and accountability that Wyatt raised as he traveled the country. The show raised many important issues about the systemic nature of police violence that aren’t often discussed in mainstream media. Wyatt is focusing on education for the entire second season of Problem Areas. I will join other authors, activists and educators–many who have stood up against corporate education reform and institutional racism, and fought for fully funded community schools–as a commentator on the program. The second season of Problem Areas airs on HBO every Friday evening at 9:00pm Pacific, 11:00pm Eastern, beginning on April 5th. I don’t know what exactly will happen with the final product of the show or what the overall message will be, but I can tell you I was impressed with the nature of the questions that Wyatt asked when he interviewed me on set in New York City and in Seattle. Given what I have heard about who some of the guests on the show are, the well researched questions Wyatt asked, and some of the locations he visited to highlight powerful education stories, I am truly hopeful that this program will help improve the national discourse about the changes needed to support public education. Now all I have to do is find some funds so I can order HBO and watch the program! 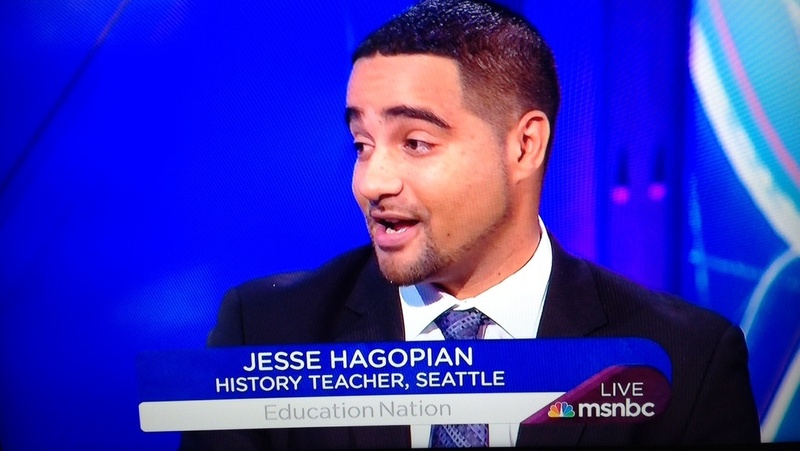 Jesse Hagopian teaches Ethnic Studies in Seattle and is an editor for Rethinking Schools magazine. Jesse is the director of the Black Education Matters Student Activist Award, the co-editor of the new book, Teaching for Black Lives, and the editor of the book, More Than a Score: The New Uprising Against High Stakes Testing.